Bring a bag and extra hands. I recommend, if possible, leaving baby at home. Bring a stroller, wagon, or your biggest Thirty-One bag (hint, hint) and be ready to fill up on great deals. Bring a friend or your spouse and tag-team the areas. Keep your eyes open – you never know what you might find (and this goes for all weekend). This year, I’ll be on the hunt for coordinating 2T outfits for the twins. If you have storage space, think ahead to outfits you’ll need the rest of the season. There will be other sales in the fall, but you won’t want shopper’s remorse for leaving a summer outfit on the rack. I promise spring and summer are just around the Allegheny river bend. Shopping for twins? Here’s a handy list of twin items that includes our must-haves! Consignors still have time to prepare their items to include in this event!!! You get 60% of the sale price (less a $10 consignor fee). If you volunteer at the sale, you get 70%. There is an event on March 27 to teach you how to tag (I just might see you there…the twins are growing quickly and our space is dwindling!) or a valet tagging option (they tag for you, you’ll make less but have more time on your hands). 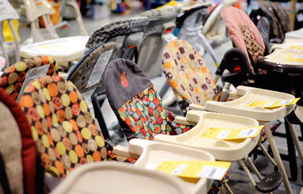 Unsure if your baby equipment meets the standards to sell? There are guidelines and when you check-in your items, there is a station that checks everything over to be sure there are no recalls. Join in with thousands of families who save 50-90% off retail prices and shop at this year’s Just Between Friends Greater Pittsburgh consignment sale March 31-April 1. Watch the blog for details on the next show in a few weeks! Want to win tickets to the March 30 pre-sale and $25 in JBF bucks to spend at the sale? Enter my giveaway which runs through March 27 at 11:59 PM. Please share with all of your friends, too! This entry was posted in Parenting, Pittsburgh Fun and tagged baby gear, giveaway. Bookmark the permalink.